In March 2015 I took delivery of a much-anticipated Tesla Model S, a 100% fully electric vehicle (EV). A couple of road trips later it became apparent that these cars were far more capable than people had ever appreciated. Conversations with friends and colleagues highlighted a strongly held perception that electric cars were totally unsuitable for long distance travel and my suggesting otherwise did little to change their views. I wondered, what if the Tesla could take on a challenge that pushed way past the limitations ingrained in public opinion? Would that help to provide some perspective on range anxiety? On pondering this thought my mind alighted upon the National Three Peaks Challenge, an event where participants tackle the three highest mountains in the UK. These being, Ben Nevis in Scotland, Scafell Pike in England and Snowdon in Wales, all of which are ascended and descended within 24 hours inclusive of the travel time between each mountain. By using the Model S as transport and not forgetting to include time for charging, we would surely go beyond the capability of an electric car. Being an already popular challenge, it presented the perfect opportunity to showcase what an EV was really capable of achieving, by combining long distance travel within very limited time constraints. And so the event Three Peaks Zero was born, the zero alluding to zero tailpipe emissions, which contaminate our environment with harmful pollutants. Along with our goal to promote sustainable transport we also wanted to raise money for some worthy charities, these being, Save the Children, and the MS Society. After a concerted burst of planning, training and fundraising we were at last ready to put our aspirations to the test. Early in the morning on a dull autumnal Friday, three eager teams set off for Fort William in Scotland to position themselves for a challenge, on 15th October 2016, which had NEVER been previously attempted. 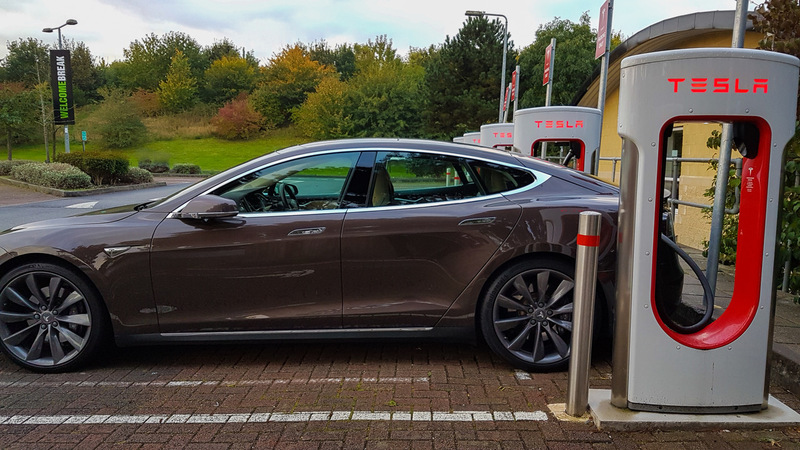 On our journey from London to Scotland the teams met up at various Superchargers, a network of rapid electric filling stations installed by Tesla to facilitate long distance travel. Whilst the cars were being charged up we amused ourselves by creating appropriate team names, something that represented the challenge we would undertake. The first team was ordained Peak Voltage. My own team was bestowed Around the Ben (Nevis). The final team, who were of a more elderly persuasion, delighted in their designated name Over the Hill. 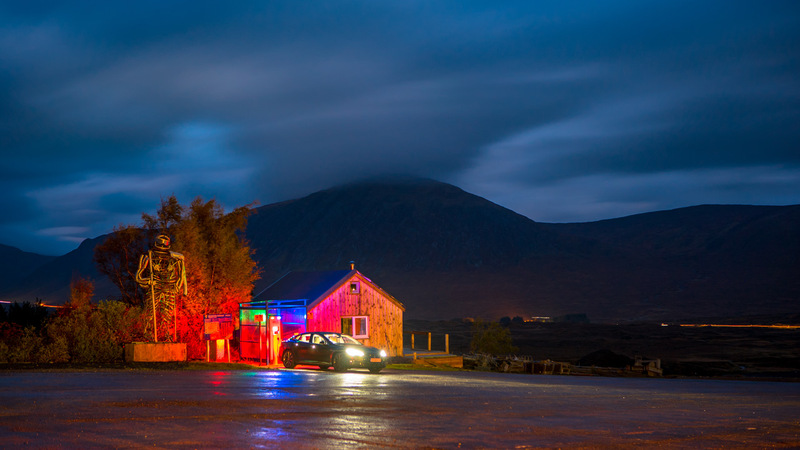 Having arrived at Fort William on Friday evening, we were 143 miles away from our last Supercharger so all vehicles required a top up before embarking on our quest at the crack of dawn the following morning. This would be the first time that any of us would be using a third party charging network. The auto industry is sadly guilty of a lack of joined-up thinking. As a result, the motorist who wishes to use an alternative charging network is subjected to a bewildering range of connection choices. Fort William station was no different and after a struggle with the various adaptors and mobile apps we managed to start the charger. As the industry develops it is hoped that the various protagonists will learn to cooperate with each other for the benefit of the consumer, by creating a more user friendly system. Having fed and bedded down our electric steeds for the night we then sought to recharge our own batteries by launching into a carb fest at the local Italian restaurant. Man Flu had prevented me from getting a decent night’s sleep and I was already half awake when the alarm hit 5 am. My diet for the next 24 hours would consist almost exclusively of energy bars and Day Nurse. I popped my first two pills in an attempt to Man Up. Once all the teams were assembled outside we drove in convoy to the start point of the climb. After a little drama with the parking we set off in high spirits at 06:05. It was still dark, so we were all sporting head torches. The mountain was dotted with dancing lights as other groups ahead of us made their way to the top. 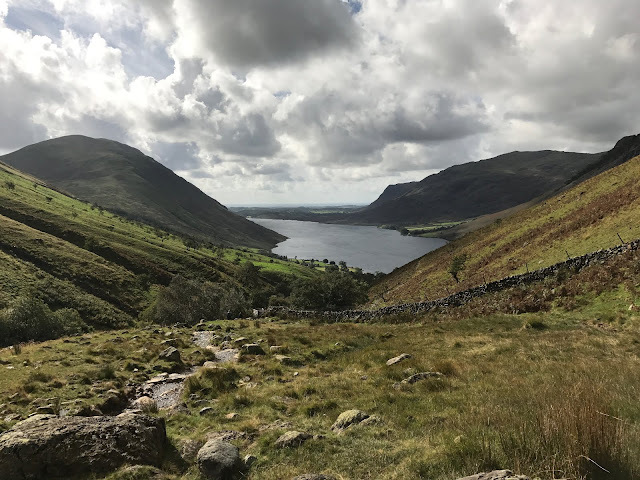 As we started the challenge I cast my mind back to my previous Three Peaks attempt and remembered that very early on I had suffered from debilitating cramp in my legs. This was a result of a combination of lack of fitness, dehydration and an overzealous initial pace. This time I was well stocked up on isotonic drinks, armed with the knowledge not to rush and had squeezed in a bit of training prior to the event. My teammates Alex and Hector, parkour instructors, on loan from Parkour Generations, had been hand-picked for their fitness and it wasn’t long before we started to pull ahead of the other teams. 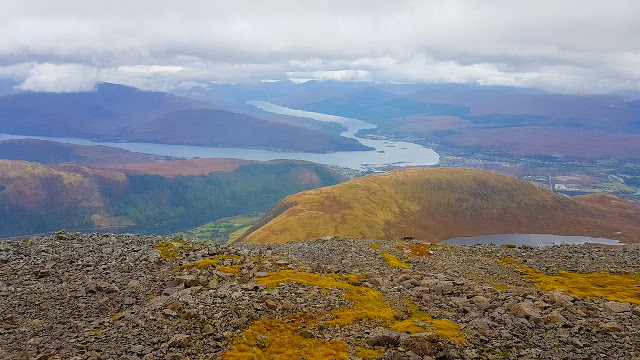 However, after a couple of hours into the Ben Nevis ascent it became apparent to all of us that the mountain demanded a different type of fitness and we found ourselves stopping all too frequently. I had calculated a maximum time that we could afford to spend on each ascent/descent and our allowance for Ben Nevis was running out. The sun had risen at this point and had uncovered some breath-taking views but also, much to our alarm, revealed that the elderly Over the Hill team were closing the gap on us with Peak Voltage not far behind. This gave us a renewed sense of urgency and we only just managed to retain our lead to the top of the mountain. In the end all three teams reached the summit within 10 minutes of each other. Parkour, crudely known by many as the art of jumping off buildings, granted us a unique set of skills to move quickly and precisely from rock to rock on the way down. I had been relying upon this to give us an edge on the descents. Like mountain goats we swiftly scrambled past other groups, rapidly reaching the bottom. Alas however, the mountain had taken its toll, our muscles had seized up and agonizing cramps ensued. Collapsing into the car we embarked on our first driving stint of the challenge. 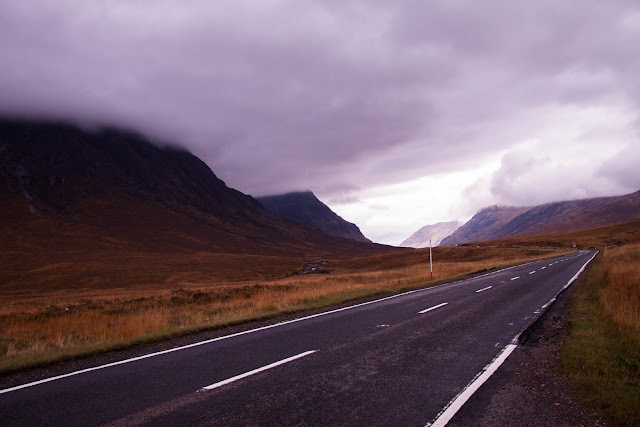 The journey south through Scotland involved the longest stretch of single carriageway of the whole trip. This was problematic due to traffic that had slowed to enjoy the sensational landscape, a pleasure in which we could not indulge. Whilst the instant torque and acceleration, afforded by Tesla’s powerful electric motor, meant easy overtaking when the opportunity arose, gratuitous use of the throttle was not conducive to long distance driving. As a result, we had to apply a little finesse to our driving strategy and maximize regenerative braking, a feature that enables EVs to recharge as they slow down, to prevent running out of juice before our first charging stop. We were making decent progress. However, as we passed Glasgow the Tesla Satnav, its destination set to Gretna Green Supercharger, warned that we would have 0% battery upon arrival. This wasn’t critical as we had the option to stop at the closer Supercharger in Abington. We debated testing the limits of the battery, in order to save valuable time in stopping twice, but thought better of it. Still in Scotland we arrived at Gretna where our plan was to fill up to 100%. 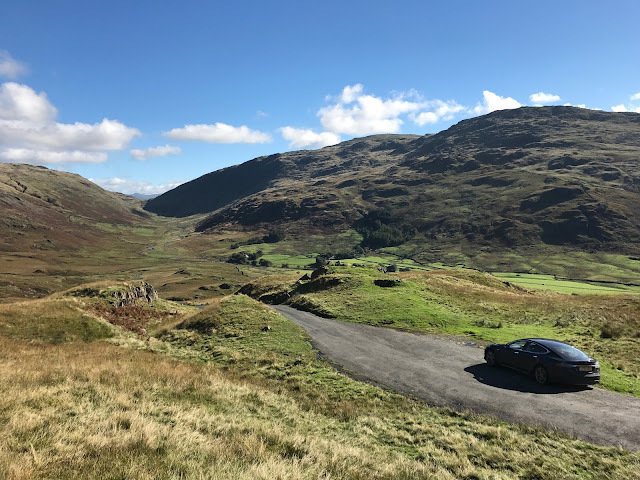 Our next Supercharger was not until Warrington near the border of Wales, plus our route involved circumnavigating the Lake District so it made sense to maximize our range. However, as the battery grew increasingly full the rate of charge began to drop dramatically and a strategic call needed to be made. Do we lose precious time waiting for the charger to add extra miles that we might need to cushion any unforeseen losses in range, or do we hit the road and try to deal with any issues as they arise? We decided on the latter and high tailed it to the National Trust Campsite in Wasdale Head, at the foot of Scafell Pike. Reaching Scafell we bailed out of the car and our trusty chauffeur Megan sorted out the parking in a prearranged spot for motorhomes with charging. Whilst the rate of charge was slow, it was more than welcome as we needed all the juice we could get. Although we were on schedule, our team was worse for wear. Our pace was slow as we took breaks that were long and frequent. Our legs were not functioning as they should, having received a battering on Ben Nevis. In addition, the urgency of our situation had escalated as we had learnt that both the other teams were far behind. During the descent of Ben Nevis, Peak Voltage had caught up and overtaken Over the Hill, who were sensibly observing a pace that was friendlier on their joints, but unlikely to enable them to complete the challenge within 24 hours. Then disaster struck as Peak Voltage suffered a serious setback when Andy, who had completed a half marathon the week before, had his knee buckle on the way down. 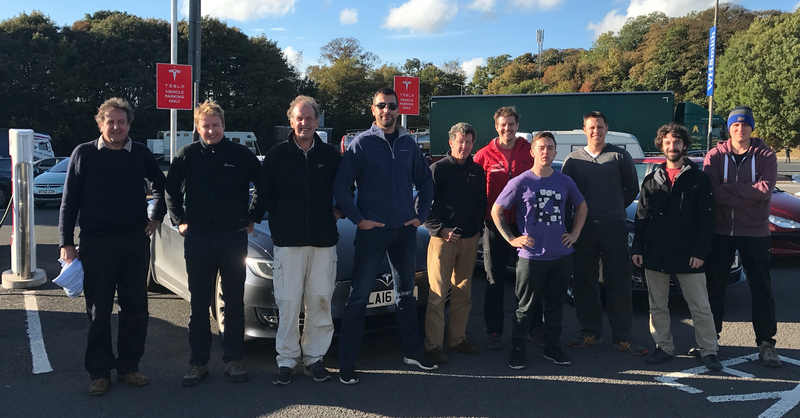 It became obvious that Around The Ben was the only team left with any hope of proving that an EV can take on The Three Peaks Challenge. As the minutes ticked by the gravity of our situation became more acute. If we failed in our task we would be doing sustainable transport a disservice by confirming people's negative suspicions about EVs. It was imperative that we succeed. Hector, encumbered by the weight of his rucksack, dumped it behind a rock and we pressed on, opting to take the faster and steeper, but significantly harder to navigate route to the summit. 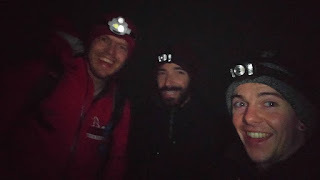 By the time we reached the top it was pitch black, the wind was blowing hard and it was bitterly cold. A thick blanket of cloud had formed making it impossible to see. Our torches amplified the problem as the light reflected off the fog. We decided to take the longer route down as it was just too risky to try to find our way via the route we had ascended. We made good progress, only stopping once to retrieve the rucksack. As we approached the bottom we were confused as to why we had not crossed paths with the other two teams. However, when looking back at the mountain we saw a procession of torches winding their way on a separate path. It later transpired that they had missed a turning in the dark. Two peaks down and one to go, we leapt back into the Tesla with renewed optimism and set off to our next stop, Warrington Supercharger. We were still on schedule, but the car informed us that we would only have 6% charge remaining by the time we reached our destination. This was much less of a buffer than I would have liked, since mountain roads tend to chew away more energy per mile. By the time we’d escaped the Lake District and dealt with the inconvenient closure of a sizable chunk of the M6, our battery gauge alarmingly revealed that we would be down to -2% on arrival at Warrington! Our hearts sank, thinking we wouldn’t be able to make it as there was no interim Supercharger to fall back on. We had come too far to fail with our goal so tantalizingly close to our grasp. We scrambled for a plan and were left with two options. ZapMap had identified a number of other fast charge points that we could stop at en-route and give ourselves a boost. Alternatively, we could chance our luck and try to claw back some range whilst going direct to the Warrington Supercharger. The former was the obvious choice but given our experience with third party chargers at Fort William, I was uncomfortable about the potential time we would squander in the faff to get the charge point to work. So in the spirit of adventure we opted to run the risk of being stranded and headed straight for Warrington. At motorway speeds, air resistance plays an increasing role on the energy used to move a car. The faster you go the greater the penalty. Simply dropping the speed to 60mph would save us some precious electrons and happily also meant we would be going slowly enough to slip stream some of the bigger fish on the road. After a short stint behind a lorry we'd recovered a few miles of range and our battery was reporting it would be at 4% upon arrival. Once again, the game was afoot! In comparison to the trickle charge we received at Scafell, Warrington Supercharger was like unleashing a fire hydrant, pumping in 350 miles of range per hour. With only 90 odd miles to Snowdon it wasn’t long before we had enough charge to be on our way. 20 hours into our ordeal our trusty Tesla delivered us to our final destination. Its job was done and the rest was now up to us. With a distinctive sense of déjà vu we once again bailed out leaving Megan to hook the car up to the grid. Only 4 hours remained to complete the challenge and although this should be sufficient we could ill afford to squander time in case of any unforeseen hazards. With this in mind and despite our exhaustion we set off at a brisk pace and resolved to keep rests to a minimum. Unfortunately, the elements conspired to retard our progress as fog set in and the darkness hindered our navigation. We had opted to take the Pyg Track, which on the whole is a very wide clear mountain path but intermittently disappears into the rock face, thus abruptly halting our passage and costing us valuable time as we tried to negotiate the route. As we neared the top we grew increasingly cold and fatigued. The route seemed never ending and due to the lack of visibility we were unable to take encouragement by being able to lock on to our final destination. We knew that each step took us closer to the top but whether it would be 20 steps or 200, we had no idea. This was definitely the most psychologically trying part of the challenge and we all just wanted it to end. At last we reached the summit, pausing briefly in the howling wind and rain to take a team photo before commencing our final descent. The fog had thickened further and we were concerned we would miss our turning down the Pyg Track. Turn too early and we would risk falling off a cliff. Fortuitously we found ourselves on the Pyg Track and made our way down, but it wasn’t long before Hector's knees gave out. Valiantly he urged us to go on ahead so that we could complete the challenge within the 24 hours. With that, Alex and I summoned our last drops of strength and ran. Stumbling from rock to rock, it was all we could do to stop our thighs from collapsing at every stride. Once again the path was deceptively long and I had amassed a collection of blisters on my feet that would occasionally get pinched when landing on jagged rocks. 23 hours & 25 minutes after our mission had begun, we hobbled into the car park with 35 minutes to spare. Our elation was short lived since we were wet, cold, exhausted and hungry. It was pitch black and at 05:30 in the morning nothing was open. We piled into the car for shelter from the wind and rain to await the other teams. Thirty minutes later someone knocked on the window. It was Hector, amazingly he had managed to get himself down in the nick of time to complete the challenge within 24 hours. 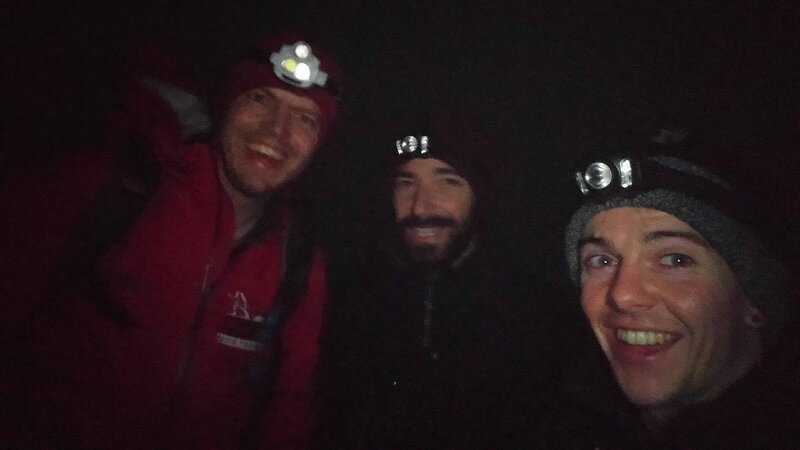 Teams Peak Voltage and Over the Hill arrived at about 7am and with determination set off on the final mountain to finish the task which they then completed in just under 30 hours. Meanwhile, team Around the Ben devoured its first hot meal since our Italian two nights previously. Our adventure proved that despite the electric revolution being in its infancy, EVs are already capable of tackling the toughest of challenges. Undoubtedly we were confronted with hurdles unique to an EV, but with charge points growing exponentially these problems are rapidly disappearing. 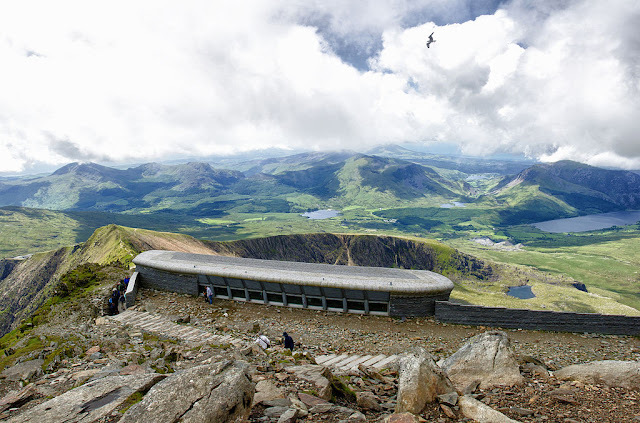 The salient point is, if an EV can already take on an extreme challenge like the Three Peaks surely it’s qualified to handle the family holiday to Cornwall or the business trip to Liverpool. In short, if Climate Change concerns you then your switch to sustainable transport shouldn’t be hampered by range anxiety. Peter from Snowdonia National Park Authority, who demonstrated enormous support and enthusiasm by trekking out in the early hours of Sunday morning to facilitate our charging at Snowdon. Moving forward we would like to turn this into an annual event open to all makes of EVs. With more teams participating in the event we will be able to boost confidence in those looking at investing in an EV. For those interested in being involved with the next Three Peaks Zero challenge, please get in touch via Facebook or Twitter. Donations for the current event will close on 01 December 16. Finally, I’d like to dedicate the success of this event to Buffy, the most wonderful sister I could have asked for. You will always be missed.